Gas-powered furnaces are the type of heating system found in most homes in the area, and their heat output is great for holding back the worst outdoor chill. But they also use electricity! The natural gas is for powering the burners that create the heat, but the furnace must power its blower fan with electricity for that heat to go anywhere. Also, most furnaces built in the last 15 years use electronic ignition systems, so without electricity they won’t be able to light the burners. You still need electrical power for your gas furnace to work—and this applies to boilers as well, which must power a circulator pump with electricity. Yes, as long as you have professionals work with you to find the right power of generator. You’ll work with our installers to determine how much power you require during an outage: do you only want to be able to run the heating system and a few essential appliances (such as the refrigerator), or do you want more electrical power? Our installers will find the ideally powered system to keep your family safe without accidentally overloading the electrical system. There are a few different options for fuel source. The best option, if available, is natural gas, since natural gas is still piped to your house during an electrical outage. The back-up generator should be able to run indefinitely thanks to natural gas. If you don’t have a natural gas line to your house, the other option we recommend is liquid propane, an efficient heating oil that can power a generator for several days. You must remember to have the generator tank full before each storm season. You can purchase an automatic standby-generator, which will turn on as soon as a power outage is detected. 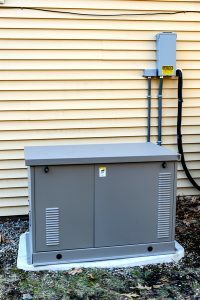 You won’t have to go outside in the cold or storm to switch the generator on, and you don’t have to worry about what happens if the outage occurs when you aren’t home. Schedule an appointment for generator installation. ServiceMax is open 24/7, all day, every day!